Okay, so I'll show you a couple more sweaters that I made for my early teen daughter and then I'll put this to rest. I made one more NKOTB sweater. The dancing singers were adapted from graphs by Wendy Phillips. This one was the most work of all and I only made the one sweater. 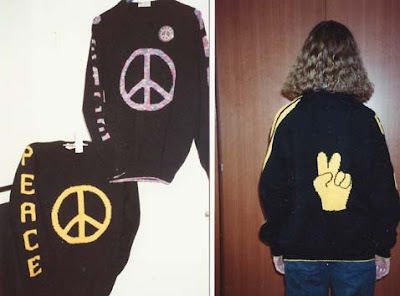 I made a Peace sweater for Jessica and one of her friends. I did the graph for the peace sign, but I got the peace V-sign somewhere else. I can't remember where. It's been a long time, 15 to 20 years ago. The peace pin seems a bit redundant, doesn't it? As long as I'm showing off old sweaters. I made this one of James Dean for one of my neighbors around the same time. She wanted it and at the time I was willing to knit it for her. It was in an old British machine knitting magazine. 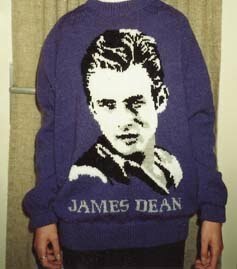 I'll show some of my other sweaters from the past, but this is it for old pop culture. Wow! These really should be in a museum. No kidding! Those sweaters are amazing. You must be the fastest knitter on the planet.